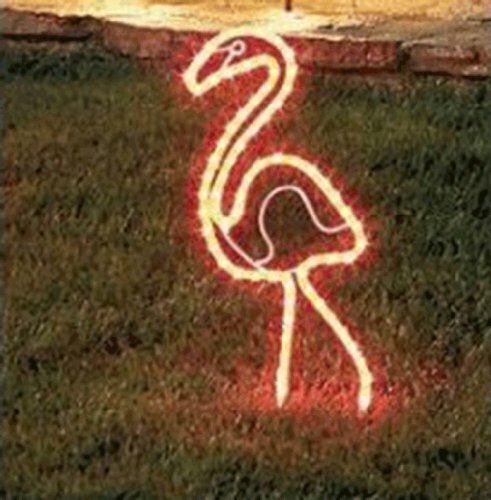 24 Inch Tropical Lighted Pink Flamingo Rope Light Outdoor Yard Art Decoration Product Description Lighted Flamingo Yard Decoration An enduring part of the American landscape, flamingos can be traced back to 1946 when they first started popping up on lawns Today's incarnation is very cool, a full 24 inches of glowing, LED duralight "pinkness," that will happily take center stage anywhere Features: 3-piece easy assembly Duralights - LED: flexible, unbreakable and pressure-resistant and designed for outdoor use Wire gauge: 18 Stand and ground stakes included UL listed for indoor or outdoor use 5 foot white lead cord 120 volts, 60 hertz, .1 amps, 12 watts Cannot be connected together with other lighted items Dimensions: 31"H x 14"W (including stand) Material(s): PVC/metal Lighting is UL listed and rated for the US market. Limited warranty applies to US purchases only. Purchases outside the US are not covered do to different electrical currents. If you have any questions about this product by EEZ RV Products, contact us by completing and submitting the form below. If you are looking for a specif part number, please include it with your message.